Parking Advisory Committee Meeting Today! Today, the Parking Advisory Committee will be taking public comment/feedback for the first time since the pay stations were implemented in downtown Tacoma today at 5:00 p.m. at Carwein Auditorium in the Keystone Building at UWT. The Keystone Building is on the north side of the grand staircase, just before the old railroad tracks. Below is my public input in the process. Tacoma has started out fairly well with the roll out of pay stations in downtown Tacoma. The pay stations have been easy to use, work well and the "shock and awe" of new pay stations has been minimal. The Tacoma City Council wisely passed an ordinance which sets parking rates at a level to obtain an 85 percent occupancy in downtown Tacoma which exactly what parking experts recommend. Now the hard and tedious work of setting rates correctly in each area begins so that the parking system is beneficial to downtown begins. The antiquated time limits on parking in Tacoma needless harass potential shoppers in downtown Tacoma. Time limits have been rejected in the literature on parking management and by comparative model cities. The clear trend is to eliminate time limits completely. In some areas in downtown Tacoma, massive vacancies prevail because of excessive costs to park and due to time limits. Many of these areas had large vacancies before pay stations were even put in. Massive parking occupancies are injurious to the life of a downtown and they need to be addressed promptly. The pay stations needlessly harass potential customers to downtown Tacoma by imposing antiquated and counterproductive time limits for parking which are harmful. The parking committee should promptly eliminate time limits and manage parking vacancy by price alone. The generally accepted peer reviewed articles published on parking management recommend managing parking by setting the correct rate, not by attempting to expunge shoppers from downtown after arbitrary time to create "turnover." See the lauded Redwood City Parking Management Plan for more detailed description as to the policy reasons why they eliminated time limits. 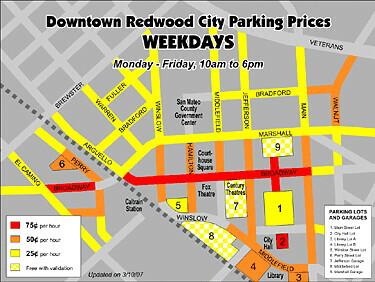 Redwood City is an especially important city as it is hailed as a model by parking experts and other cities implementing market based parking management. MR: What should San Francisco, or any city trying to reform parking policy, do about time limits? DS: The other thing I think that San Francisco is doing and that Redwood City did and that Ventura has done is eliminate any time limits on the meters. They removed the time limits and they rely on pricing to create turnover and vacancies they don't have to worry that they have to get back to their meter in an hour or two hours. 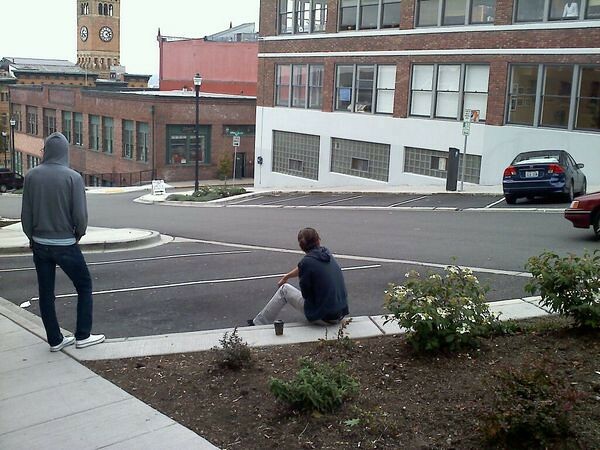 Whatever they're doing, they don't feel like they're pushed around so much by the city. People now don't have to worry -- a driver and three friends want to go for dinner some place and they park -- It still creates a lot of turnover because the price is higher, but the user is more in control of their life than when somebody who manages meters says you can only stay here for an hour or two hours. 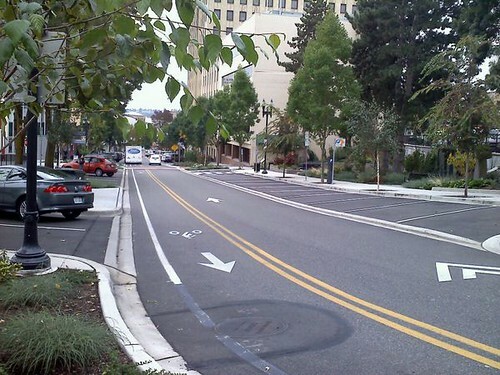 If Tacoma is going to obtain a good result from it's parking system, and minimize harm, it is critical that it implement the best practices available. Model cities: In addition model cities such as Redwood City and San Francisco have no time limits. (SF has a few areas with 4 hour time limits). Both of these cities have been hailed as model cities for their management of parking. At most SFpark meters, time limits for regular parking will be four hours; some meters will have no time limits at all. The SFpark pilot will emphasize the use of demand-responsive pricing to achieve parking availability goals, so short time limits may not be necessary or desirable. Easing time limit restrictions makes parking more convenient for drivers, but it does not mean that everyone will park longer. Extended time limits simply allow some people to park longer if they want to. No restaurateur wants her customer to skip dessert or coffee because of a parking time limit. Simply put, the City of Tacoma has made a well intentioned error in trying to improvise and lasso together a market rate system with the antiquated harsh penalties of time limits. Time limits do nothing more than require extra staff time to register each vehicle in their system and then seek out and ticket cars and penalize shoppers to downtown which have been deemed in the area too long. Potential customers know they are being monitored and must abandon downtown or risk being ticketed for "chain parking" even if they have the willingness to pay to stay longer downtown. Only in a misguided government program would a "customer" be treated so punitively for simply desiring to purchase more product (downtown Tacoma). Parking enforcement officers should be doing nothing more than simply looking to see if a car has paid for their parking. If they have not, the car should be appropriately ticketed. If they have paid, the car should be left alone. Solution #2: Promptly Reduce Parking Fees in areas with low demand. The city should set the parking rate to manage parking at the right price where "the right price is the lowest you can charge and still have a few vacant spaces" and where "one of of 8 spaces is vacant." In his text High Cost of Free Parking, Shoup point out that parking should be free if necessary to accomplish this. Tacoma should have a regular method to modify parking rates periodically based on vacancy on a block with the goal to have 85 percent of the spaces full. If raising or lowering parking rates in an area is discretionary, the decision becomes needlessly and counter-productively political. Tacoma is not going to be able to modify rates hourly like San Francisco by each pay station. However, Tacoma can change them monthly administratively based on the vacancy in each block. The smallest area as possible should be examined for vacancy rate to calibrate to the unique demand in each area. Lumping in large areas of downtown together creates harmful errors in rate settings for adjacent businesses. In Redwood City, the city council passed an ordinance which orders the Parking Manager to adjust parking rates up a or down a quarter periodically based EXCLUSIVELY on parking vacancy. B. At least annually and not more that quarterly, the Parking Manager shall survey the average occupancy in each parking area in the Downtown Metered Zone that has parking meters. Based on the survey results, the Parking Manager shall adjust the rates up or down in twenty-five cent ($0.25) intervals to see to achieve the target occupancy rate. Thus, Tacoma should modify the price for parking in a similar manner to the method Redwood City does to take politics or other consideration out of the equation. The rate set for parking in each area should be set based on parking occupancy alone, not on collateral factors or attempts to drive one groups of people from one end of downtown to another or into city owned parking garages or private lots. So long as the target occupancy rate is 85 percent, there will always be spaces available and most areas will be nearly full. Martin Osborn, the manager of Puget Sound Pizza on South Seventh Street, said Tuesday that chasing away the chain parkers has hurt his lunch business. Charging $0.75 per hour may not have been a bad place to start, However, Tacoma needs to make critical harm preventing adjustments quickly. If managed properly, downtown Tacoma will eventually have a different rates throughout downtown based on the demand for parking. The rates may vary from $0.25 on 7th to $1.00 in front of the Tacoma Financial Center but should depend on demand. by fredo on 10/7/2010 @ 5:23am Erik, your recommendations are correct and should be adopted IMO. One note: The map you have posted at the end of your piece is supposed to be of Olympia but it's actually of Redwood City. by Erik on 10/7/2010 @ 9:49am Thanks Fredo, I have made the correction and made some additional commentary. It will be interesting to see what comes of tonight's hearing. by Marty on 10/7/2010 @ 10:35am The redwood city plan is considered by many to be one of the best written plans for parking. However, it may just be me, but I have concerns out outcomes assocatiated with the Redwood City plan. And comparing Redwood City to Tacoma is a little bit of apples and oranges. I know that Redwood Ctiy has great theories, and we should adopt as many as possible, but I think Tacoma needs to work on a plan for Tacoma and our unique needs. by Marty on 10/7/2010 @ 10:45am A few comparison numbers. 1800 - On street parking stalls in the system, with several hundred more that surround it. by The Jinxmedic on 10/7/2010 @ 10:57am I still don't understand that $50k for parking PR to Jayray. I think O&J did more to educate people on the paystations and time limits than Jayray did, and therefore, I want my cut of that there $50k. Grrr. by fredo on 10/7/2010 @ 11:17am "I still don't understand that $50k for parking PR to Jayray." Jayray was a former employer of the Mayor and is closely associated with LeRoy Jewelry store whose owner is on the parking committee. Does that help your understanding? by The Jinxmedic on 10/7/2010 @ 11:22am That part I understand. I still want my cut. Thanks for the link. However, there is nothing in the article that suggest that their parking management plan isn't working. Second, the Tacoma City Council already passed an ordinance which is supposed to set rates at a level at 85 percent occupancy which is identical to Redwood City. The only difference is that Redwood city has no time limits and has a systematic method to change rates based on demand. Tacoma will indeed be in troubling detrimental condition if they disregard best accepted practices in the literature on parking management and model cities and attempt to improvise their own method. Tacoma has done this far too many times and on too many issues in the past and suffered greatly for it. Good intentions are not enough for success. Parking vacancy rates vary with the cost charged in each and every city. Issues like public art may be dealt with by improvisation. However, like medicine, there is a science to parking management and improvising something is perilous in both situations. Potential shoppers in Tacoma don't want to be harassed by needless time limits any more than potential shoppers to downtown Redwood City, San Francisco or Ventura. by Crenshaw Sepulveda on 10/7/2010 @ 2:00pm Less than ten transactions per week per stall. That is not sounding promising. That works out to less than 2 transactions per day per stall 6 days a week. Given two hour blocks we have about 40 percent parking utilization on average. Where have all the cars gone? Even on farmer's market day right now, St. Helens is mostly vacant. JayRay really should give that money back to Tacoma, we got played for suckers. by The Jinxmedic on 10/7/2010 @ 4:00pm @NIN- agreed. I think everyone who has posted on FeedTacoma regarding the parking stations should get a cut of the JayRay monies, as we did their work for them. by fredo on 10/7/2010 @ 4:18pm "Less than ten transactions per week per stall. That is not sounding promising"
I liked your methodology and conclusion Crenshaw. Don't think any money is going to be returned by Jay Ray. Think about it. Once the new changes are made to the plan such as removal of time limits and the change in parking rates, we will need to hire them again to retrain the public. This is bound to cost another 50 grand. Don't worry though, it's someone elses money. by Erik on 10/7/2010 @ 4:54pm Nice worky work there Crenshaw. I have never done that calculation. Obviously some areas are full and some are completely dead and they need to be treated quite differently. However, getting the meta view is very useful. The decisions now for downtown parking need to be data driven at this point. I started a group on Flickr entitled Tacoma Parking Occupancy. Feel free to add your photos to this group. Anyone who is inclined to take pictures and post them (posting the date and time) would be doing a public service to downtown Tacoma and giving the Parking Advisory Committee and the rest of the public crucial occupancy data. I use my Flickr account for this. Let the chips fall where they may. The more information, the better. It should help focus the discussion on parking and what needs to be done in various areas of downtown. by Crenshaw Sepulveda on 10/7/2010 @ 5:38pm How about one side of the street long term parking (4 hours or more) and the other side of the street short term parking (2 hours or less). Would make for an interesting experiment and I'm seeing all of this as experimental except for the money we gave to RaJayJay. by Erik on 10/7/2010 @ 9:41pm Nice calculations Crenshaw. Let's see. 17,000 transactions per week. That is 3400 transactions per day. If there are 1800 parking spaces downtown then that amounts to 2 transactions average per day per stall. Pay stations are active from 8:00 a.m. to 6:00 p.m. per day (10 hours total). Thus, even if every visitor to downtown purchased the maximum 2 hour limit, parking spaces would be full 4/10 = 40 percent of the time. This is the best case scenario. Of course, many people no doubt purchase less than the maximum. Certainly a long ways from the target 85 percent occupancy. If the average purchase was one hour, the average occupancy downtown would be 20 percent occupancy. Parking occupancy rate might go up in the future. However, they are overall still very very low. There are many blocks in downtown currently which are empty almost all of the time bringing down the average. by Crenshaw Sepulveda on 10/8/2010 @ 12:06pm They charge for parking 6 days a week. This can get ugly for those attending events at the Pantages or other downtown venues. Two hours really doesn't cut it for most of the events downtown. Come downtown, pay for parking, watch a nice show, come back to your car and find a $35.00 ticket. Way to encourage people to support the art in downtown. by Erik on 10/8/2010 @ 2:36pm Robyn from the Villa posts this picture and commentary from Market Street concerning the huge vacancies in the area. Having whole blocks of deadness is not good. Is anyone from the City of Tacoma watching this? Solution: Market Street has always been a street with very low demand for parking. Even when offered for free, most of it was dead. Reduce the price promptly and expand the time limits. It may need to be reduced to zero depending on demand. Some parts of downtown Tacoma that have too many empty parking spots might get longer time limits or drop out of the paid parking system altogether, a top city engineer says. Let's hope they follow through. by L.S.Erhardt on 10/8/2010 @ 4:09pm Again, this drives home a point: People will pay to park when there is something they want to do in said area. This is why the UWT area is still congested. Nothing to do+paid parking = high vacancy. If I were the City's engineering team, I would strongly look at what's actually in an area before I put in meters. Honestly, meters on 6th from Steele to Alder makes a LOT more sense than meters on Market. by Erik on 10/8/2010 @ 5:02pm Good points Thorax. The highest demand for parking other than in front UWT is around the courthouse. The road is congested around there from people circling the block looking for spaces. Placing pay stations around the County City Building would certainly be a benefit to the area. Today�s the day if you want to tell Tacoma�s Parking Advisory Task Force what you think about paid parking downtown. The public can comment on anything related to paid parking beginning at 5 p.m. during the task force�s meeting in Room 537 at the Tacoma Municipal Building, 747 Market St. The task force meets twice a month, and all meetings are open to the public, but public comment is accepted only once a month. The City has still failed to adjust the price of parking based on demand or remove the counter productive time limits. 5+ months later, swaths of A street, 7th Street and several blocks of Broadway have vacancies from 40 to 90 percent far in excess of the desired vacancy rates. The City should have reduced the parking rates in these area months ago. 7th Avenue is averages 80 percent vacancy every day, a near complete dead zone. Is the City just going to leave it like that? by L.S.Erhardt on 3/3/2011 @ 2:14am Yup. by fredo on 3/3/2011 @ 6:18am What... the city would introduce a dynamic new initiative requiring frequent review and refinement...then abandon it? by Erik on 3/3/2011 @ 12:13pm Here is how 7th Street looks nearly everyday at nearly every hour. A near complete dead zone. Pretty hard to consider starting or maintaining a business in a place like this. by fredo on 3/3/2011 @ 12:27pm Erik, I sympathize. But the reality is that the parking kiosk operater has invested alot of money in these pay stations and probably has a pro forma P & L statement which accompanies the installation and the assumption that the kiosks and policies are going to be maintained. Nobody is going to want to put in paystations costing thousands of dollars only to find out the public doesn't want them. Of course, this is another one of the topics which JayRay conveniently forgot to inform the public about. Even if the paystations and parking rates are a complete albatross for the city to bear...they are here to stay. by tacoma1 on 3/3/2011 @ 12:34pm I don't care if the city employees have to leave their cars at home, use the pay lots, or park at the T Dome Station. Who else would be parking there? People on the sidewalks make a city vibrant, not empty cars at curbside. by NineInchNachos on 3/3/2011 @ 12:46pm instead of paying some private company to deport people we should just use that money to pay people to hang out in our downtown. They've gone out of their way to get here seems like a waste to send them away at great expense. You seem exceptionally (unusually) wise today. by NineInchNachos on 3/3/2011 @ 1:05pm how dare you! by Jesse on 3/3/2011 @ 1:15pm Erik: The picture above purveys a temporary situation at 7th. McMenamins pub will fill this street up. Also, from where that picture is taken, you could back up five paces and be in free parking. Why would people park on 7th when free parking is open just paces away? I WAS all for the pay for parking thing until recently. I thought they would get rid of developers parking requirements after paid parking went into effect. You know, the first step in switching to a market based system instead of dictating numbers of parking spaces to developers and wondering why old buildings are being torn down for surface level parking. by Erik on 3/3/2011 @ 2:00pm @Jesse: You are right of course. Parking demand will no doubt change based on all sorts of different factors as they do in every city. SF changes changes rates hourly. Tacoma should adjust them at least every month. Why would people park on 7th when free parking is open just paces away? Yes, demand is so low in this area, that it may be that the "right price" for parking her is zero. Even if the spaces on 7th were free, it is doubtful they would be full. This makes sense for SF, I imagine, because of the high elasticity of demand there. In other words, people may want cheap parking in SF but they are prepared to pay what ever is required. Here in Tacoma we don't enjoy that elasticity. People might pay 50 or 75 per hour but if it gets much higher they just park in an outlying area and hoof it. by Erik on 3/3/2011 @ 5:55pm Here in Tacoma we don't enjoy that elasticity. Right on Fredo. But Tacoma has not even made the initial pricing adjustment from when then put in the pay stations even though 5 months have passed. "TACOMA, Washington -- Business owners and commuters in Tacoma are upset over what some say are overly aggressive parking enforcement tactics. Signs on the doors of downtown Tacoma businesses warn customers to pay for their street parking immediately or face a $25 ticket that can appear in a matter of seconds." 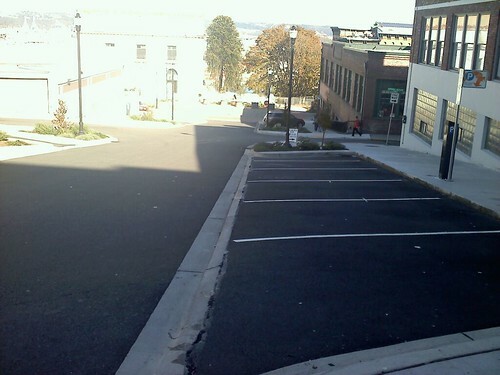 by fredo on 3/3/2011 @ 6:07pm Don't you suppose Erik, that neither the city nor the owner of the kiosks had any idea that demand for the parking spaces would be as insubstantial as it turns out to be? In other words they may have had some conversations about the need for flexibility based on supply and demand but didn't expect that the value of the spaces might be as little as zero? It wouldn't be the first time the city council has employed it's reverse midas touch. I wonder how many merchants will remain after the experiment with the kiosks is finished. by Jake on 3/3/2011 @ 7:17pm Working for several Downtown businesses we haven't really had many complaints about the parking meters. Generally it has been the older crowd (seniors) that complain from what I am told. There are usually spots open around the businesses now that weren't there before which is good for customers. One thing I would like to see is parking rates go up on Broadway between 11th & 13th. That street is still a big hassle to find parking. by jenyum on 3/3/2011 @ 9:15pm Yes, there is never any parking on Broadway, especially at lunch time. by jenyum on 3/3/2011 @ 9:18pm OT: you know Kevin when I try to use the back button from an i.feedtacoma blog or a comic after posting a comment I just go back to the top of the page. 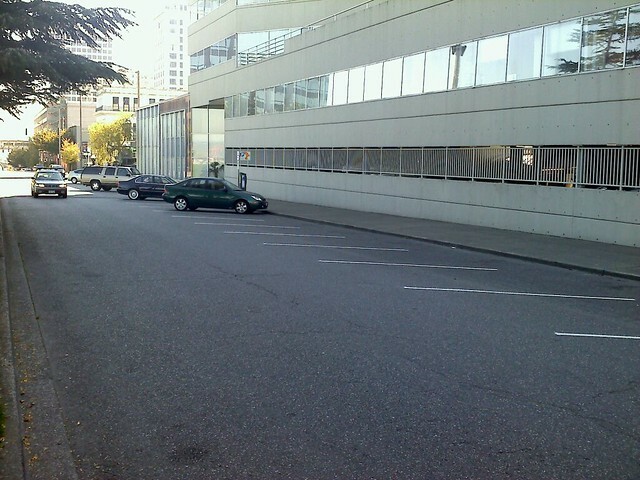 by Jake on 3/3/2011 @ 9:49pm "Yes, there is never any parking on Broadway, especially at lunch time." Going to the bank at 4pm is hard. Even on Saturday night trying to get a spot to go to a certain (empty) Chinese restaurant was a bit of a pain. by Erik on 3/4/2011 @ 1:00am One thing I would like to see is parking rates go up on Broadway between 11th & 13th. That street is still a big hassle to find parking. I agree. The parking rate in that section of Broadway and in front of UWT probably needs to be increased a bit and see what happens. St. Helens and Antique row typically have 40 + vacacny rates and the rates need to be reduced here as well. The demand is so low on 7th Street by PSP, it may need to be removed from the paid parking area. There are only a few blocks which justify charging for parking on Saturday if any. Most areas have only one or two cars on each block. Saturday should be free for the foreseeable future. by fredo on 3/4/2011 @ 4:22am "One thing I would like to see is parking rates go up on Broadway between 11th & 13th. That street is still a big hassle to find parking. I agree. The parking rate in that section of Broadway and in front of UWT probably needs to be increased a bit and see what happens." Have you ever looked at how many vechicles in these busy areas have handicapped placards hanging from the mirrors? They aren't subject to the parking rates are they? You could raise parking to $5 per hour and the people who don't have to pay would still be there. Does enforcement check these handicapped cars to verify the signs are legit? I'm in favor of helping the handicapped but why should they get free parking and there should be tickets given out for fraudulent sign usage. by jenyum on 3/4/2011 @ 3:21pm Fredo I don't know how it works in washington but in a lot of states the placard is assigned to the individual not the car. So as long as the sign itself is valid there is no way to check without harrassing individual people, this would be incredibly intrusive as not all disabilities are immediatley apparent. by fredo on 3/4/2011 @ 4:20pm "as long as the sign itself is valid there is no way to check without harrassing individual people, this would be incredibly intrusive as not all disabilities are immediatley apparent." jen. I'm confused. Why is it harrassment to verify that disabled permits are being used appropriately? If an officer asks me for my license and registration and insurance papers, is he harrassing me? I would think real disabled people would want these verifications because people with phony permits are taking their parking places. I know that all disabilities are not apparent, but I frequently see young men who look as athletic as jessie owns leaping out of their cadillac escalades while parked in handicapped spots. Donald Shoup, an economist and urban planner whose work underpins many cities� approach to paid parking, said finding the right price for street parking is the key, and the right price eliminates the need for time limits. In other words, find the price that creates the desired turnover, then let people buy as much parking as they want. Come on Tacoma. Take a look at the article and make the right decision.